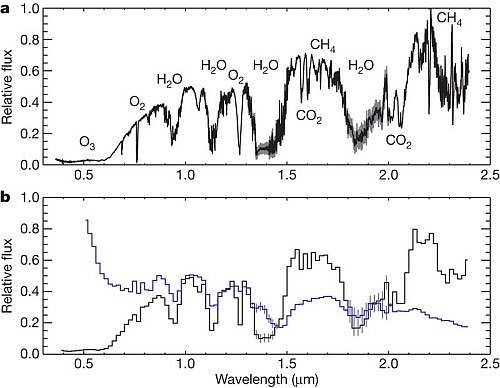 As we get closer to finding analogues of Earth, an important consideration for the characterisation of extrasolar planetary atmospheres is what the transmission spectrum of our planet looks like. 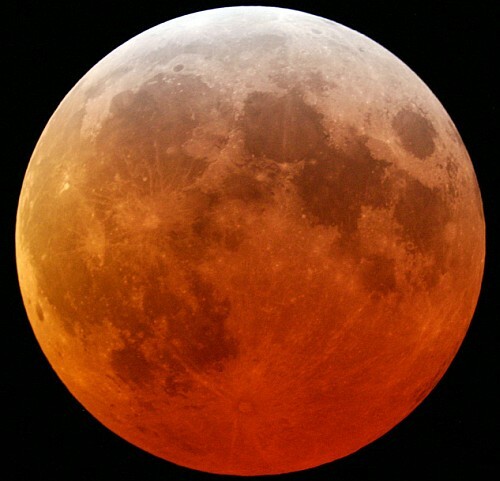 Recently a team of astronomers, using LIRIS on the William Herschel Telescope and ALFOSC on the Nordic Optical Telescope simultaneously, have been able to obtain for the first time the optical and near-infrared transmission spectrum of the Earth during a lunar eclipse. At the time of a lunar eclipse, the reflected sunlight from the lunar surface within the Earth's umbra is entirely dominated by the fraction of sunlight that is transmitted through an atmospheric ring located along the Earth's day-night terminator. 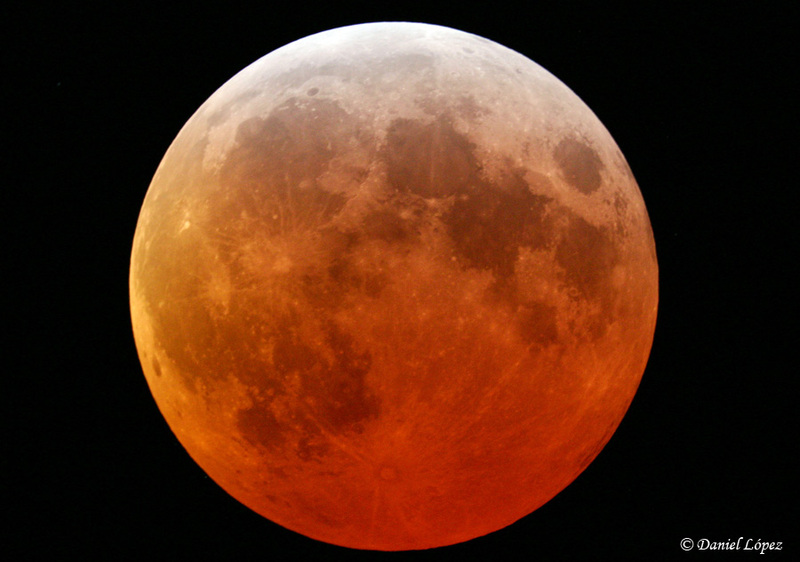 Observations of the lunar eclipse on 16 August 2008 allowed astronomers to characterise the Earth's spectrum as if it was observed from an astronomical distance during a transit in front of the Sun. Except for some early attempts with photographic plates, spectrocopic lunar eclipse observations in visible or near-infrared wavelengths have not previously been undertaken. It is known that the Earth's optical and near-infrared transmission spectrum is red -that is, more solar flux successfully passes through the atmosphere at longer wavelengths, as can be inferred from simple naked-eye observations of a lunar eclipse, or of a sunset/sunrise. The rising nature of the transmission spectrum towards longer wavelengths is caused by the Rayleigh scattering of air, which, in addition to the ozone absorption bands, is rather efficient in scavenging short wavelength radiation through a long atmospheric path. An artist’s concept of the sunlight glowing through the Earth's thin atmosphere and reaching an observer on the Moon during a lunar eclipse. Credit: Gabriel Pérez Díaz, Servicio MultiMedia (Instituto de Astrofísica de Canarias). [ JPEG ]. The Moon during a lunar eclipse. The red light illuminating the Moon's surface during the eclipse has gone through the Earth's atmosphere and carried the information of all the major Earth atmospheric components. Credit: Daniel López (Instituto de Astrofísica de Canarias). [ JPEG ]. During a transit, the starlight that passes through the planet's atmosphere travels through a much larger atmospheric path than the starlight that is directly reflected by the planet. This causes the reflection and transmission spectra to be different. 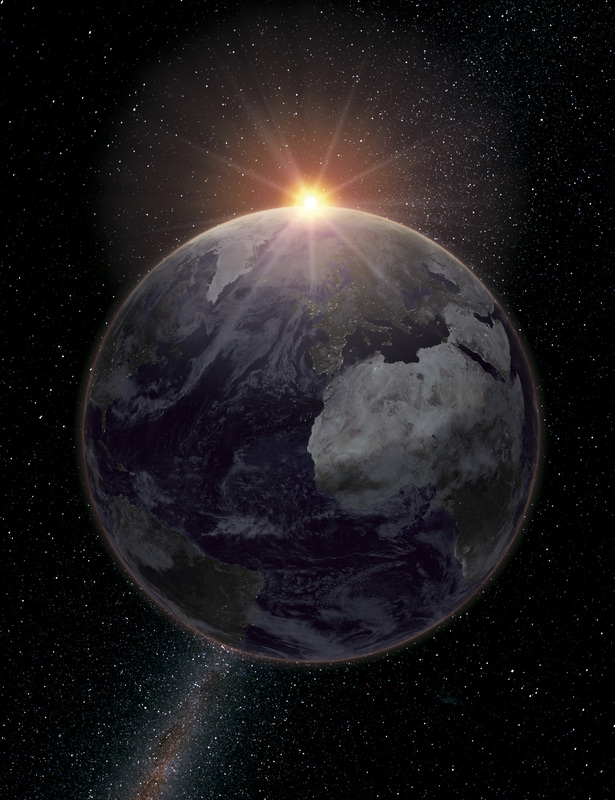 In transmission, the Earth is brighter in the near-infrared range. In contrast, the Earth´s reflection spectrum appears blue because of the very same Rayleigh scattering effect expels the short wavelength radiation back to space. 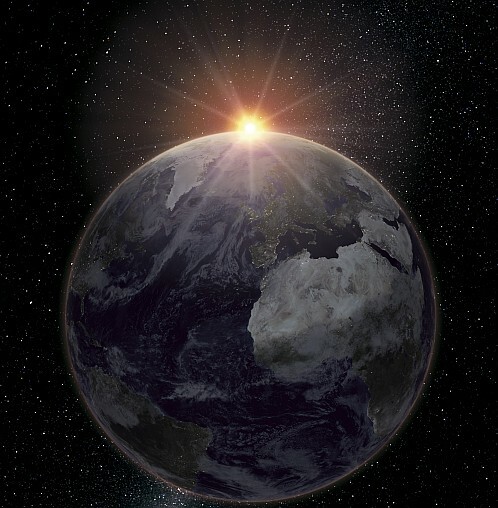 Because of the blue colour, when observed from an astronomical distance, the Earth is often referred as the pale blue dot, but in transmission, the pale blue dot becomes the pale red dot. a) The observed Earth's transmission spectrum, with some of the major atmospheric constituents marked. b) A comparison between the Earth's transmission (black) and reflection (blue) spectra. It is readily seen from the figure that the reflection spectrum shows increased Rayleigh reflectance in the blue. It is also noticeable how most of the molecular spectral bands are weaker, and some non-existent, in the reflection spectrum. Adapted with permission from Macmillan Publishers Ltd: Nature (E. Pallé et al., 459, 814), copyright 2009. [ JPEG ]. 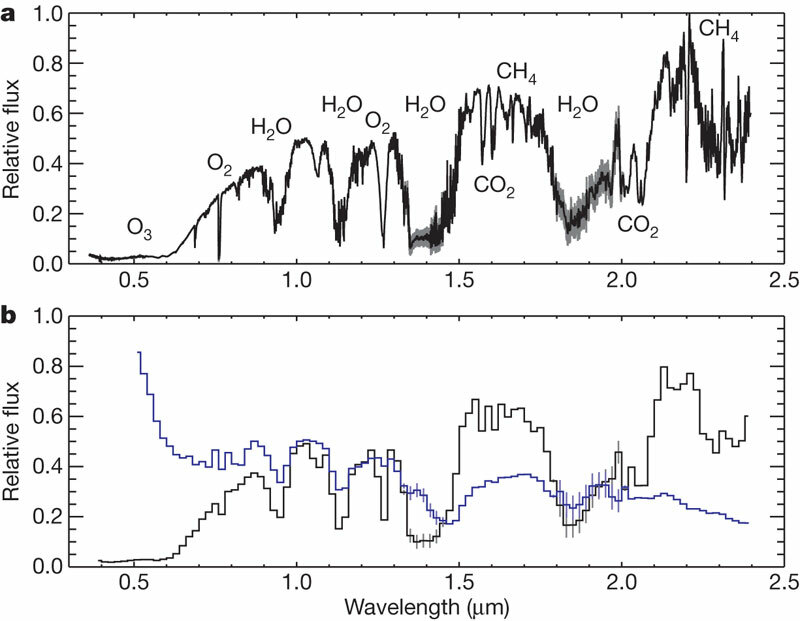 The astronomers readily detected the spectral bands of O3, O2, H2, CO2 and CH4. Trace amounts of N2, OClO and NO2 (a gas mainly produced by human activities) might also be present in the data. The presence of the Earth's ionosphere is also revealed in the transmission spectrum through the detection of relatively weak and narrow absoprtion lines corresponding to singly ionised calcium, CaII. Pallé, Enric, Osorio, María Rosa Zapatero, Barrena, Rafael, Montañés-Rodríguez, Pilar; Martín, Eduardo L., 2009, "Earth's transmission spectrum from lunar eclipse observations", Nature, 459, 814. "Las observaciones de los eclipses de Luna ayudan a encontrar nuevas Tierras", IAC press release, 10th June, 2009. Available formats: HTML | TXT (local). "The Search for ET Just Got Easier", STFC press release, 10th June 2009. Available formats: HTML | TXT (local).